Glen Mazzara is best known for working on seasons two and three of The Walking Dead, but his latest project is all his own: He’s the creator, executive producer, and showrunner of Damien, a new drama that imagines the Antichrist character from The Omen as a young adult grappling with his true identity. We’ve seen the first episode—full of dread, spooky encounters, some gnarly deaths, and a lot of soul-searching, as well as an intriguing but brief appearance by a supporting character played by Barbara Hershey. We can’t wait to see what happens next. In the meantime, we talked to Mazzara about his love for the 1976 source material, as well as where Damien will take us this season. io9: What was it about The Omen that made you want to base a series off its main character? Glen Mazzara: I really enjoyed that film. I felt like that was a type of horror that I responded to, in the sense that it was grounded. It felt somehow plausible. You can imagine hearing this weird story from some frantic person, that there were these odd deaths, and a little boy, and nobody knows what to believe, and people think they’re crazy to think that there’s something supernatural at play—and yet you can’t explain all these coincidences. So that shook me when I was a kid, when I first saw The Omen. Because I did actually watch it when I was very young. I knew who Gregory Peck was, so I bought into it: “Oh, this is a classic film.” It had some heft to it. It always left an impression on me. Although I did enjoy the sequels, I felt that if I was to take that original film as the starting point, and say, “Now what happens next, right after the first film?”—that gave me a lot of questions to answer, and just opened things up. That’s what I wanted to have in a TV show. Something that was complex enough that would take me multiple seasons to answer all of those questions, as to where he’s been, what’s really going on, who’s involved. It just seemed rich enough to be worthy of a series. So the TV show is only tied to the 1976 film, and none of the sequels. That’s correct. It’s a direct sequel to the Richard Donner-David Seltzer film. We did fudge the timeline, since the show takes place in the present day, we’re saying that the [events of the show] take place 25 years after [the events of the movie]. We’re just not specifying the exact date. The first episode of Damien introduces us to the character on his 30th birthday. He might not be totally nice to his ex-girlfriend, as we see in the episode, but he seems like a pretty normal guy, all things considered. What’s he been up to since the events of his childhood, as seen in the film? He’s been trying to find his way. Unfortunately, everywhere he goes, death and mayhem follows. He has to stay on the move. When we meet him, his past is catching up with him, and he’s realizing that certain things he’s always feared about himself are true. His usual pattern of running doesn’t hold up anymore, and he has to try and figure out a way out of a situation that he can’t possibly escape. He doesn’t want to believe [the truth about his identity], but the evidence is irrefutable. It’s really about, what do you do if you have this curse that you’re supposed to destroy the world? Do you embrace that? Do you fight that? That question may not have just one simple answer. That’s the nature of the show, and I hope that anyone in the audience will sit back and think about what they would do, if they had that curse. What’s the significance of making him a war photographer? It was a few things. One was that there’s a photographer in the original film, and I liked the way that they used photography in the film. So that was part of the palette, if you will. And also, I wanted Damien on a world stage. I wanted him to be world travelled. The idea that he was on the run from his past would put him into the role of a wanderer. He’s trying to connect with people, and a war photographer would be a person who’s incredibly compassionate and trying to tell stories about people who are suffering, and that the rest of the world is ignoring. That felt like it was serving the human side of Damien. But also—having war, famine, disease, and natural disasters around him also serviced the evil side of Damien. That profession really sort of encapsulated everything I wanted to say about the character. And when we think about where the character is going, and the rest of his journey, the war photography has become a bigger and bigger part of the show. The tone of the show seems very dark, at least judging by the first episode. Is that going to continue or will there be any lighter moments? I think the show is always dark. And yet there is a type of black humor that you’ll see throughout some of the other episodes, as Damien realizes he’s in an absurd situation. It is always an intense show, but what I think is funny may not be funny to the audience [laughs]. Maybe my sense of humor is very dark. But there’s something there, though we never veer into camp. The stakes are always high. We never have anyone making light of the situation or not believing in it. We wanted to embrace the horror, and the idea that Damien and the other characters are living in a world, as we describe it, [that] has been punctured by evil. And now evil is seeping in. It’s great to see Barbara Hershey—whose long career in acting includes some memorable horror roles—as part of the cast. Did you always have her in mind for the show? Like all of the roles, Barbara’s character, Ann Rutledge, was very complex right off the bat. I did a lot of work thinking about that character. Although you only meet her for one scene in episode one, the relationship that she has with Damien is a major storyline throughout the show. We really needed someone who could play a lot of different things at once. Barbara Hershey stars in A&E’s “Damien.” Photo by Ben Mark Holberg. I’ve always been a Barbara Hershey fan, and that name just popped out. So I wrote her a fan letter and sent her this script—and again, she’s only in one scene in the [first episode], so I had to describe who this character was, and also describe who I was, as the showrunner, and what sort of collaborative process I wanted to have with her. I really do want the actors on this show to read the material, give feedback, and we all work together—it’s a very collaborative environment. We met, and talked, and she was interested right away. I have to say, I’ve absolutely loved working with her. I’ve learned so much from her, and have just been so impressed with the way she spends a lot of time on the material and finds layers that I couldn’t even think of. How important will the Catholic Church be to the story? Very important. It’s a major storyline that we’re drawing inspiration from, from the original film. That said, there are also other factions that are coming after Damien. Some are known to the characters, and some are not known. That was fun, to write not just one conspiracy, but multiple conspiracies trying to take control of the Antichrist. Do you expect the show to be controversial? Certainly, I’m aware that if you take on religious themes—and you have characters talking about the Bible and acting on their Biblical beliefs—[that] could cause a controversy in some way. What I’m proud of on the show is that we take the theology very seriously. We’ve done our research. I was raised Catholic, I went to Catholic school for 12 years, and I have an uncle who’s a priest. So I’m very respectful of the religion behind this. When we have religious characters saying religious things, I feel that we paid a lot of attention to make sure what they were saying was authentic and not a caricature or a stereotype. We really tried to write them as characters with deep beliefs. We’re not exploiting religion just to make an interesting TV show. We’re trying to discuss very serious themes in a fun pop-culture show, of course. We still want it to be thrilling and scary, and all that. But we’re treating it seriously. How important will special effects be on Damien? Well, it is a horror show, and we do have special effects. But it’s not something we ever rely on. I was very surprised at how much we wrote, and intended something to be special effects, and then were able to do practically. We have some episodes—especially in the back half of the season—where there’s a lot of practical effects, which I’m proud of. Our production team and our directors were brilliant at bringing stuff that I thought wasn’t shootable to life in a practical manner. We do have special effects, but you’d be surprised at how many normal TV shows, even without a horror element, use special effects. It’s easy to brush things up digitally. But I think for the major stunts, the major horror gets, we tried to do them practically. The cast of A&E’s “Damien.” Photo: Art Streiber. Between shows like Damien, and Lucifer, and movies like The Witch, Satan is having a major pop culture moment right now. Do you think that’s true, and if so, why do you think that’s happening? I think horror comes in waves sometimes. We had a bit of a vampire thing, then a zombie thing, and now we seem to be having a Satanic and possession wave right now. And it’ll probably turn around. It’s what excites people. I think the Satanic aspect just has not been done on TV in a credible way lately, and a lot of writers, directors, and actors are excited about the fact that horror is being done very well on TV right now. There are a lot of great horror shows, it’s an interesting field—and there’s an audience that’s interested in that. I think it’s a natural cycle of entertainment. I don’t know if it appeals to anything in the larger psyche, though probably people are anxious or fearful about the unknown. People feel threatened if you think about the horrible mass shootings that we’ve had, or some of the threats that the country has faced. People do feel that they’re being threatened by some unknown that can pop up at anytime. That’s scary. So maybe it’s in the zeitgeist for that reason. 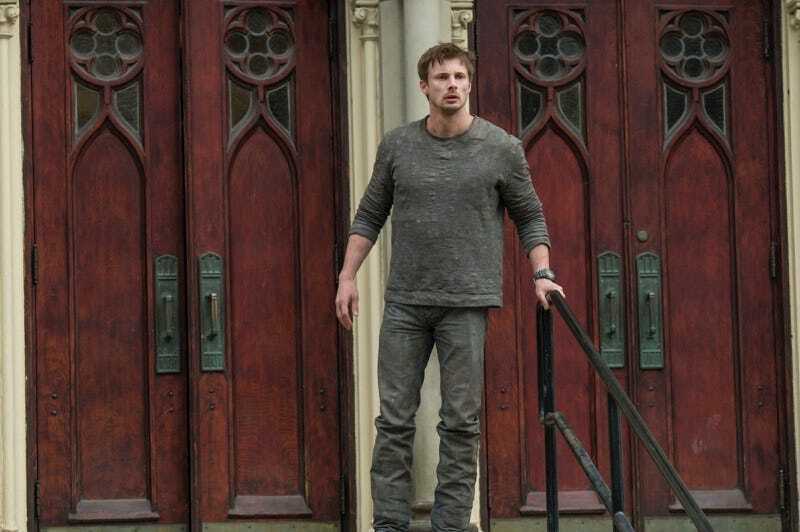 Damien begins March 7 on A&E.